Isn't it time to restore the road signs? The three grey objects at the bottom of the picture are posts that used to hold up road signs directing motorists through the town. But then Cheshire East Council became the local authority and decided that signs were not needed here. UPDATE: In July 2015 the posts are still there, as pictured. Could the signs be restored one day? The pedestrian crossing furniture was replaced in the Spring of 2015. WHEN is Cheshire East Council going to admit they got it wrong when they decided that there should not be road signs in the centre of Nantwich - and restore them? 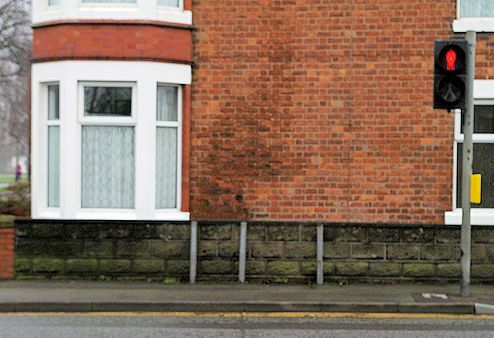 I'm more than a little tired of having to tell motorists who stop me for directions that "You should be going that way" (as I point in the opposite direction to which they are travelling) "but you could turn round just up there, if you like." The look of frustration on their faces after a long time of going round in circles trying to get out of Nantwich becomes one of despair as they realise they aren't going to get straight directions such as "Go down there, take the second road on the right, and then straight on." that could get them home. Actually, if I was wrong about the signs - I must check some time - they could have ended up in Crewe or, worse still, in Stoke-on-Trent - 16 or more miles away from Nantwich. If that had happened I don't know what time they would have got to their destination. I knew we were in trouble when the driver said: "We aren't on the A49 any more, are we?" Well, no. They hadn't been on the A49 for many miles. I didn't ask, but I'm guessing that they decided on a detour to see Nantwich - a move they must have been regretting. Fortunately, they could reach their destination on another road out of Nantwich - if only I could get them on to it . . .
Don't misunderstand me. I don't mind trying to help lost motorists. Not at all. But that's a job I would rather not do - if only the council would put the signs back! and from which, in all probability, the people in the cars will wish to see the town on foot - and spend some money in the shops. As I found out in August 2009, it is all to do with road classification. As I said at the time: "A member of staff in Cheshire East Council highways department told me it was all to do with the reclassification of Millstone Lane from an A road to a B road. It seems that B roads don't have road signs . . .! (Unless things have changed since then!). The highways man went on: "The idea is to get cars and lorries not to use certain roads in Nantwich." True, there had been an accident involving a lorry in which two pedestrians walking along the footpath were killed. So presumably car drivers have to suffer so that lorry drivers can't find there way into town with which they are not familiar. But then, what about sat navs . . .? But, with several supermarkets in town, lorries keeping supplies on the shelves topped up are in town regularly because they know their way without the need for signs. Round houses route Where did this street name sign go? HERE is another problem involving signs, but this time it is a street name sign that is missing. Of course, having got into town, many drivers will be looking for a particular street. They won't get much help here. 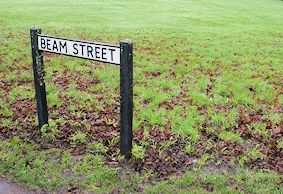 There used to be two signs, side by side and nearly at right angles on the corner of Beam Street and Barony Road. Then one day the Barony Road sign was lying back at an awkward angle. Whether it had been hit by a passing car or vandalised, I don't know. Not to worry, I thought, Cheshire East Council highways department will swing into action and put it back up. Not so. The next time I looked it was as pictured here. The sign was no longer there. And it has been absent far too long for it to be simply away for repair. Actually, I don't recall that it was damaged, just not securely standing in the grassy area. Barony Road is the A51 so the situation with B roads doesn't apply here. THESE are two signs showing the way out of Nantwich. Top left is the direction sign that used to be on the pair of posts on the left of the three in the picture at the top of this page. The trouble is that the sign pointed along the aforementioned B road, sending traffic along Millstone Lane. The sign on the right is the one that now sends drivers out of town in the opposite direction and "all round the houses" All round the town, as well. 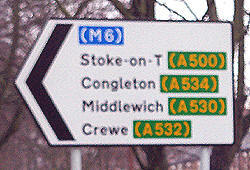 Odd how the A534 points to Crewe on one sign and Congleton on the other. The latter is just further on. And what if you want to go to Stone, Staffordshire? That's not listed on the new sign. Well . . . there is bound to be a knowledgeable pedestrian around somewhere.